The sword art of Mugai Ho Shinshin Ryu is based on the sword art of Kuniba Ha Mugai Ryu. This art was taught to Albert Church Jr., Soke, Shorinji Tetsu-Kempo / Kamishin Ryu, while living in Japan in the 60's. Mugai Ryu was founded by Tsuji Gettan Sukemochi in 1693. At the young age of 26, he received his Menkyo Kaiden (full transmission) in Yamaguchi Ryu Kenjutsu and created his Mugai Ryu style. Over the next 300 years the Mugai Ryu splintered with several known Mugai Ryuha. The most common line of Mugai Ryu was passed down through the Takahashi line. In the early 1900's the 12th generation Soke (head-family) Kyutaro Takahashi chose Nakagawa sensei as his lineage inheritor. It was Nakagawa sensei that tried to bring together the factions of Mugai Ryu into one line, this proved unsuccessful. Nakagawa eventually chose Ishii Gogetsu as his lineage successor. Later Ishii Gogetsu broke from Nakagawa sensei and continued teaching his line of Mugai Ryu. It is a point of contention as to what happened to the Nakagawa lineage, some show a Mugai Kai of four seperate inheritors others to Shiokawa sensei. In 1952, Shogo Kuniba, Soke, Motobu Ha Shito Ryu, began training in Mugai Ryu Iaido under Ishii Gogetsu, Soke. Over the next 15 years, Kuniba sensei continued developing this art under the organization of the Seishinkai/Seishinkan. Church sensei learned this art during this time. Over the next 10 years, Church sensei continued developing the art under the organization of the Nippon Kobudo Rengokai into his personal style of Kamishin Ryu Iaijutsu. 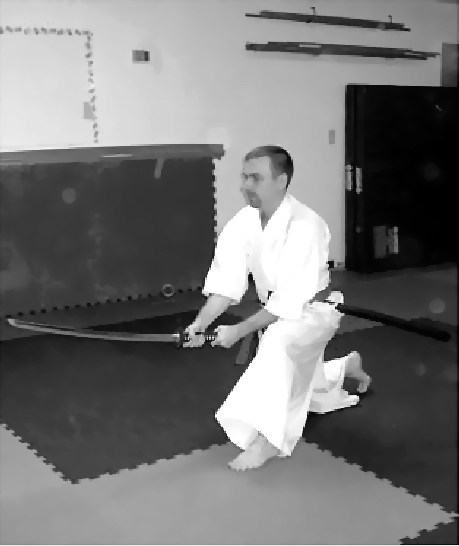 These teachings include Kuniba Ryu Kata (Seiza no bu (kneeling) and Tachiwaza no bu (standing)), bokken training (katana no kata) and in advanced training, Tameshigiri (test cutting). Mugai Ho Shinshin Ryu Iaijutsu is considered by the head-family to be a modern martial way (Gendai Budo) based on the traditional Japanese sword art of Mugai Ryu. The use of the term "jutsu" instead of "do" in the art of Iai is not intended to imply the art is necessarily a "battle" defensive art but that it is not as concerned with philosophical improvements of the practitioner usually associated with "do" arts.